My New Zealand correspondents Mark Hoffman and Alan Bulmer have been keeping me updated about their fascinating fishing exploits. Here's a bit more for your delectation. I know that we don't catch these fish here but I think that the parallels are amazing, even down to the dog's hind leg. I trust this note finds you in good health and that the English winter weather is behaving itself. As I mentioned in my last e-mail, we spent the weekend in Whangamata and managed to get out on the estuary every day for three consecutive days to wet a line. On each occasion soft bodied lures (Alan's been giving the shad type lures and other rubber jobs a thorough testing) were used extensively although colour combinations and lure type varied between fishermen.The results were very good despite the fact that it was a holiday weekend with lots of boat and foot traffic. 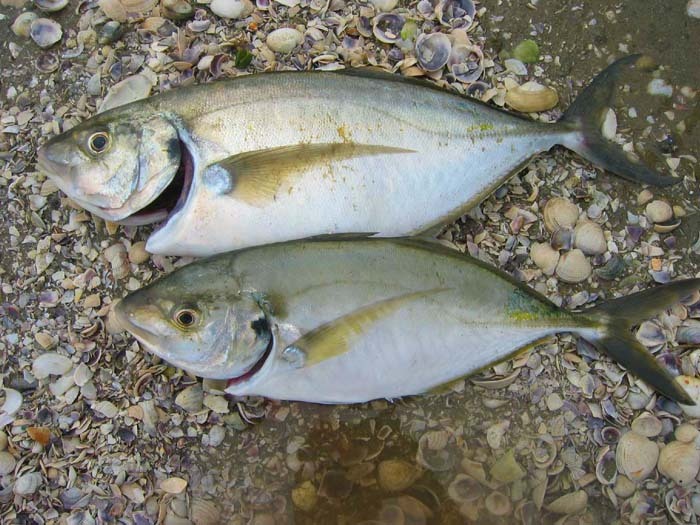 On Saturday we landed and kept two excellent silver trevally (I think it's Pseudocaranx dentex - they have many species of these jacks Down Under, lucky devils!). The largest was the 4 lb. specimen in the attached photograph. The smaller fish is only 2 lb. but gave a much better account of itself, especially as it was caught at dead low tide with no tide run. The estuary was alive with moving fish and there were lots of small inanga (~ 1-2" long) in the margins. The successful lure on both occasions was a 2.5" Mister Twister sassy shad with a dark back and pearl white belly. 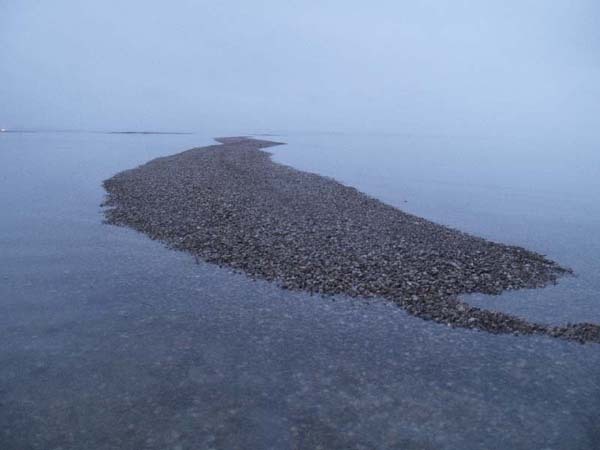 The fish both struck within 2-3 jerks of the bait after it had initially sunk and settled on the bottom. On many occasions it was possible to feel the bites as the lure descended. The weather conditions were warm (~ 23C) but overcast with a hint of sea fret on the surrounding hills. The smaller fish had a preliminary nibble and absolutely monstered the bait when it was jerked away rapidly. Line was Fireline with a 6' shock trace of Rio Powerflex. Despite many teethmarks and strong bites we were unable to hook up on snapper. They were mouthing the lure but not hooking up. I attached a small free swinging treble as a stinger but they largely managed to avoid that as well. I even lost a fish when the treble came free from the lure immediately after hook-up. On Monday the weather was significantly hotter (27 C) as low tide coincided with the hottest part of the day. Even though there were still inanga and large yellow eyed mullet in the margins, they were not moving much and there was no visible predator activity. We fished nearly 2 hours for a grand total of 3 half hearted touches. Plenty of lure changes (including hard bodied) but no change in fortune. Doesn't this always happen when expectations are highest? There was lots of boat activity and my belief is that the large fish had simply moved out into the deepest part of the estuary and were lying doggo until later in the day when traffic subsided and the temperature dropped. Unfortunately the deepest part is outside of casting range. 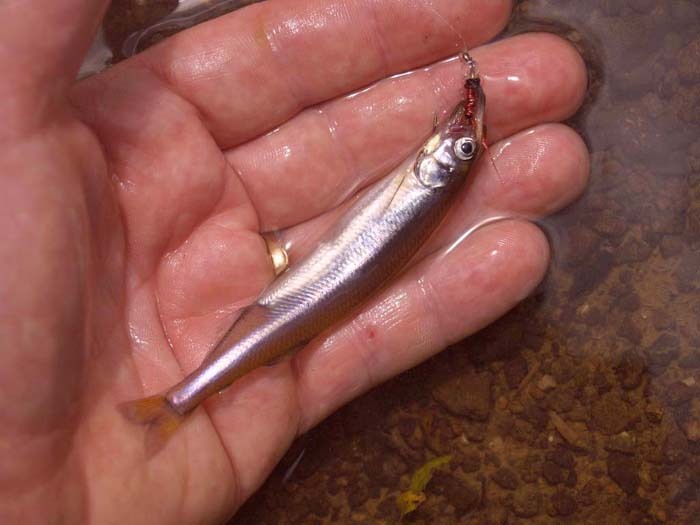 In summary, it appears that we are finally making progress with soft bodied lures. The use of braid coupled with the correct retrieve speed and action greatly improve success. 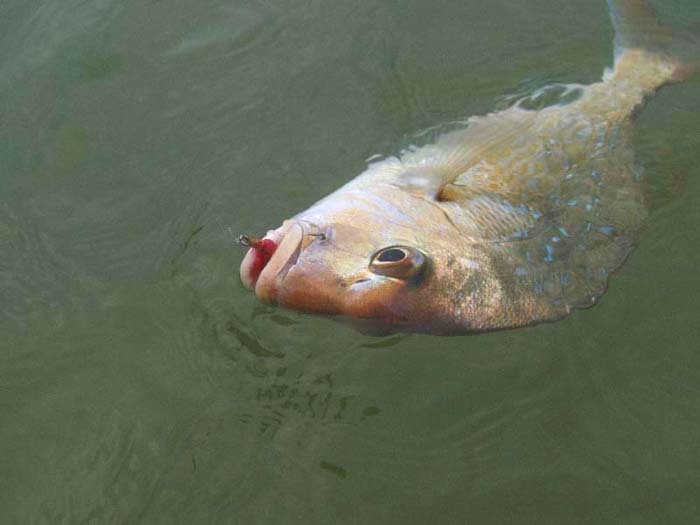 All we have to nail now is how to increase the hook up rate on snapper! Any ideas? 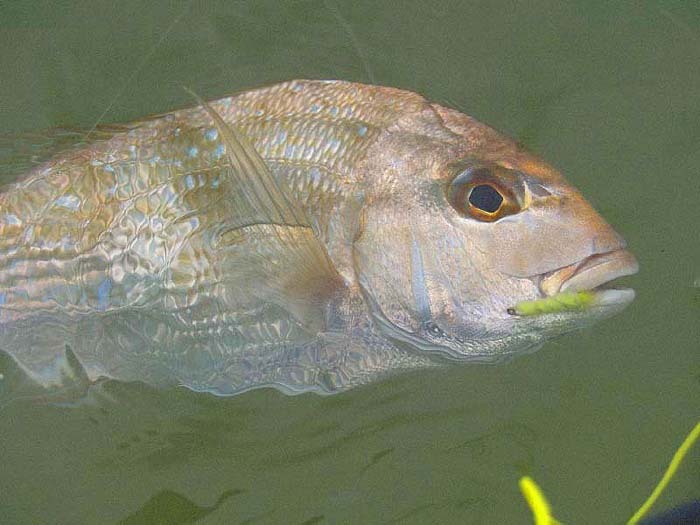 It is barely conceivable that 12 months ago we had never caught snapper on a lure and now we are regularly targetting snapper on Fireline using soft bodied lures. Our strike rate on Trevally has also increased substantially. It is such a sensitive, exciting technique. Brilliant! Interestingly, we have yet to nail a Kahawai on a soft plastic. I wonder if the retrieve speed is too slow for kahawai? The two fish in the photograph were the first trevally we have taken for the table for some time and they were divine when sprinkled with black pepper and lemon juice and fried quickly in a hot pan with a knob of butter. Apologies for the lack of action photographs but my wife is the digital camera master as she was not with us on the estuary. Once again thanks for all your help. Look forward to your comments. I also had another picture or two from Mark Hoffman along with the following note.